This Applet will tell you what your server is sending for MIME (Multipurpose Internet Mail Extensions) types and what it should be. If you discover errors in the what it server is sending, notify the ISP (Internet Service Provider). If you discover errors in what the MIME type should be, notify me. 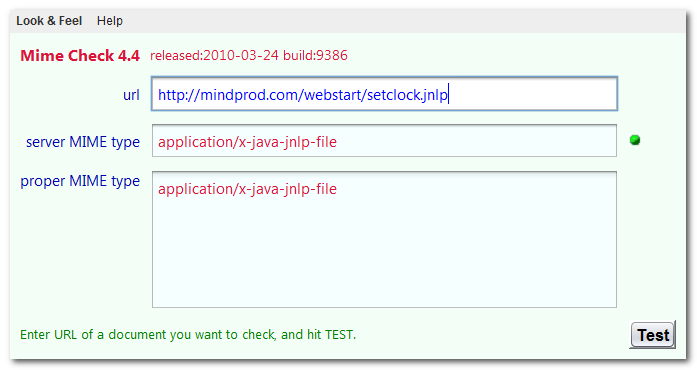 Alternatively you can download Mimecheck and run it as an application. For this Applet hybrid to work, you must click grant/accept/always run on this site/I accept the risk to give it permission to read from any server on the web. If you refuse to grant permission, the program may crash with an inscrutable stack dump on the console complaining about AccessController.checkPermission. for the current version of MimeCheck. Ensures server is sending the correct MIME types. 611K zip for MimeCheck Java source, compiled class files, jar and documentation to run on your own machine either as an application or an Applet. access mimecheck source in repository with [Tortoise] Subversion client on wush.net/svn/mindprod/com/mindprod/mimecheck/. download ASP PAD XML program description for the current version of MimeCheck. MimeCheck is free. Full source included. You may even include the source code, modified or unmodified in free/commercial open source/proprietary programs that you write and distribute. Non-military use only.